Oculus may be dominating the news about personal video headsets thanks to Facebook, but there are other similar devices hoping to make their place in the market. 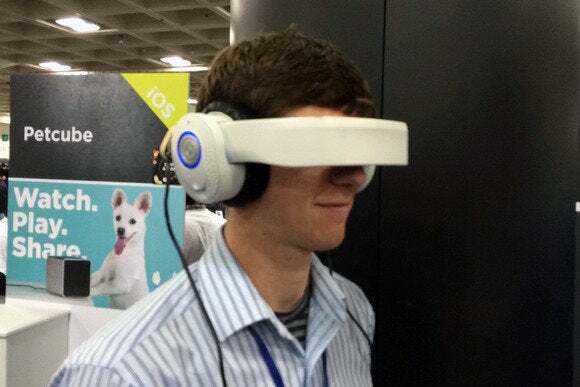 Avegant makes one of those devices, and at Macworld/iWorld this week, the company is showing prototypes of its Glyph mobile personal theater. In simplistic terms, Glyph consists of a pair of headphones with a display mounted in the bar that connects the two cans. 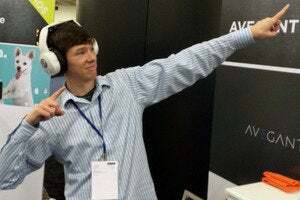 You can wear Glyph like a regular set of headphones, but the bar moves down over your eyes so you can see the display. You end up looking like one-half of a popular electronic music duo. Glyph has an HDMI connector, and you can connect your iOS device or Mac with the proper adapters. Avegant says that Glyph’s display has more than 1.8 million pixels, a contrast ratio of over 1000-to-1, and a 45-degree horizontal field of view. During the five minutes I wore Glyph, the 3D demo video featured colors that looked vibrant and accurate, and the images were sharp. As for the headphones, Avegant says Glyph supports both active and passive noise canceling and has a frequency response range of 20 to 20,000 Hertz. My demo didn’t play any audio, so I can’t comment on the sound quality. The one issue I had is that in viewing mode, I had to hold the Glyph prototype in place. Glyph rests on your nose in order to align itself with your eyes, and I have a low nose bridge. That meant that when Glyph rested on my nose, my line of sight was above the display and I couldn’t see it. A company representative said that the final product will be much more refined and lighter. Glyph started as a Kickstarter project to raise $250,000; the company ended up with more than $1.5 million. So there’s definitely some excitement about it. 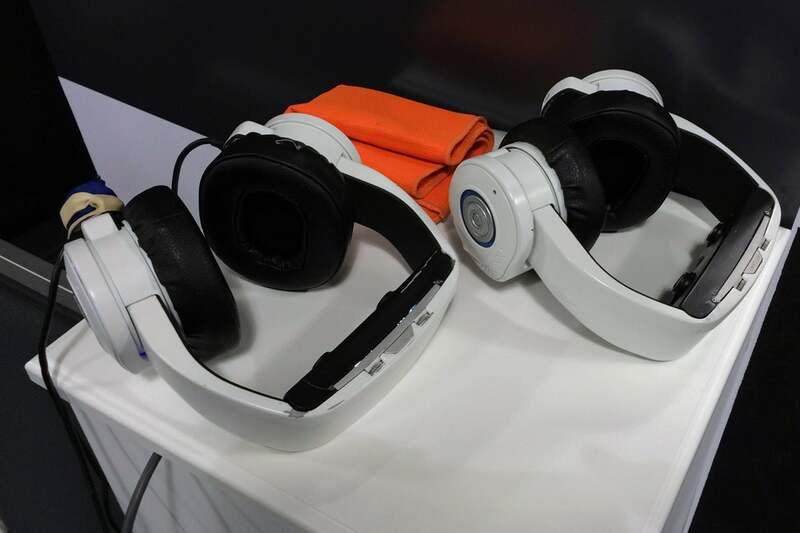 Avegant hopes to start shipping Glyph later this year.